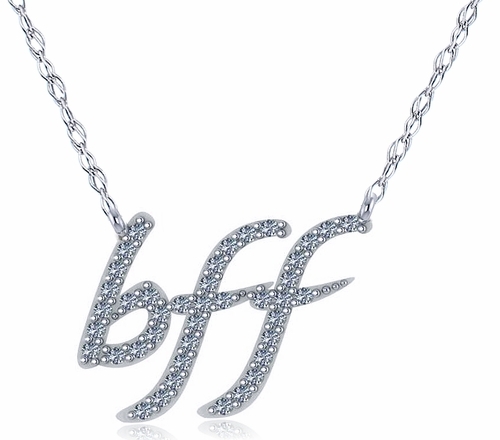 The BFF Best Friends Forever Prong Set Round Cubic Zirconia Necklace features the forever popular way to show that you are best friends forever with a friend or significant other! 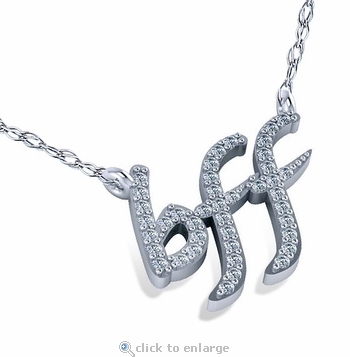 The bff letters are beautifully adorned with shared prong set diamond quality cubic zirconia rounds for a sparkling effect with a total carat weight of approximately .21 carats. Our Russian formula cubic zirconia are hand cut and hand polished to exact diamond specifications and coupled with a high quality gold mounting for the look and feel of a genuine fine diamond necklace. 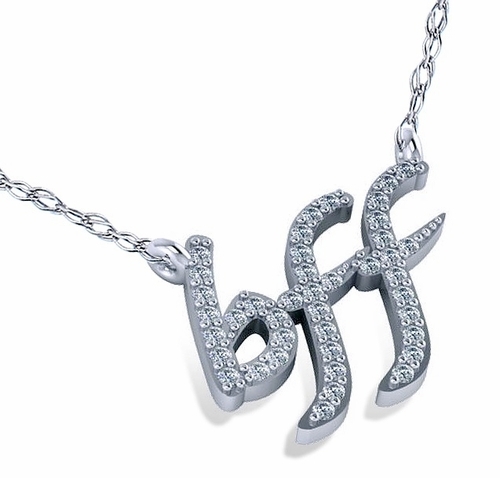 The pendant measures approximately 12x16mm and comes standard with a 16 inch chain length. An 18 inch chain length is also available, please see the pull down menu for options. Choose from 14k white gold or 14k yellow gold. For further assistance, please contact us at 1-866-942-6663 or visit us via live chat and speak with a knowledgeable representative.